Santiago Calatrava’s work explores the significance of place and its human context by considering both topographical and cultural landscapes. In this sense, Calatrava believes that it is fundamental to form a relationship – a feeling and sense of spirituality – with a physical site. In the wake of the September 11, 2001 terrorist attacks on the World Trade Center in New York City, Calatrava was commissioned to build a new transit hub that connected PATH trains from New Jersey with New York City’s subway system. The steel and white marble structure, which bears a striking resemblance to the contours of birdwings, encompasses approximately 800,000 square feet with 225,000 square feet of retail space. The structure is meant to evoke the form of a white dove, an international symbol for peace. The structure is called “Oculus,” but is more commonly referred to as the World Trade Center Transportation Hub. World Trade Center Transportation Hub, Designed by Santiago Calatrava. Rendering courtesy of the Port Authority of New York. 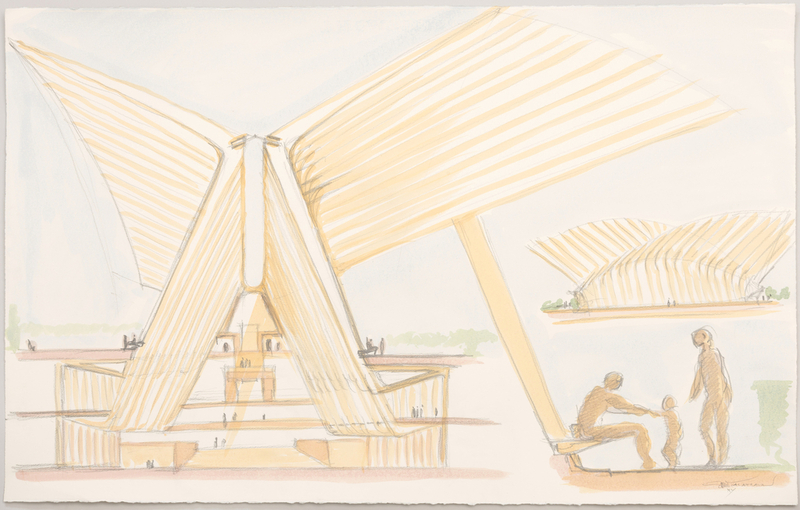 For Calatrava, drawing is a fundamental part of his design process. The architect’s sketches fill notebooks, which line the shelves of his New York City townhouse. He often communicates his ideas not with words but rather with images and has been known to stand in front of a rapt audience sketching rather than speaking. This drawing for Oculus reveals the architect’s time-honored approach. The elegant geometry of the bird-like structure is revealed at two different elevations. The side view, at right, evokes the form of wings spread wide. It also affords a view of an architecture that bears a proximate resemblance to the organic, undulating forms of Modernisme, an early-20th century design movement associated with Spanish-Catalan architect Antonio Gaudi. The cross-section view illustrates the multi-layered character of the space, home to the PATH train and several intersecting New York City subway lines, as it extends many floors underground. Designing for public use and interaction is a central concern for Calatrava. In that vein, the architect’s design has been compared to another great civic work of the last century, Whitney Warren’s Grand Central Terminal, for which Cooper Hewitt holds a drawing in the museum’s collection. Calatrava’s design for Oculus, first revealed in 2004, takes special care to consider the need for ample light and vast, open public spaces, expressing his sensitive approach to building on a site weighted in great significance. Set to be completed in early 2016, the Oculus is already an icon of 21st-century design. I’m concerned and certainly confused about the opening paragraph of this narrative as it could be used to describe almost any building. It doesn’t bring the reader any closer to understanding the intent and the resulting architectural development of this specific project. This is a significant project on several levels and deserves a more studied explanation of its design. Drawing, World Trade Center Transportation Hub, New York, NY: Sketch, ca. 2014. watercolor and graphite on white wove paper. Gift of Santiago Calatrava. 2015-35-1.